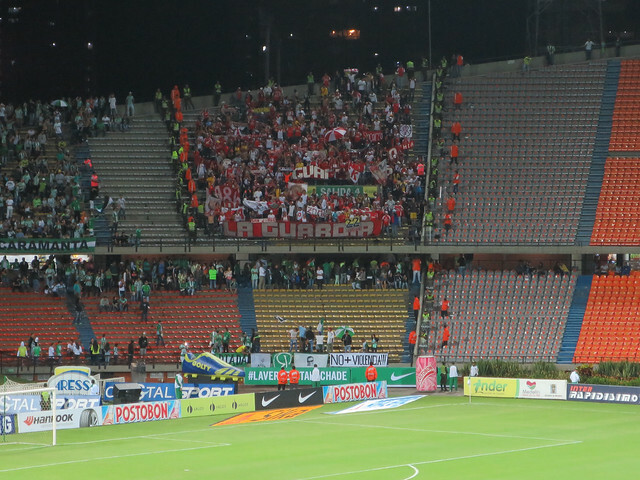 May 11, 2014 — My friend Eric of Trans-Americas Journey was back in Medellín, and invited me to join him at the second of two semifinal matches between the home team Atlético Nacional and Bogotá’s Independiente Santa Fe. 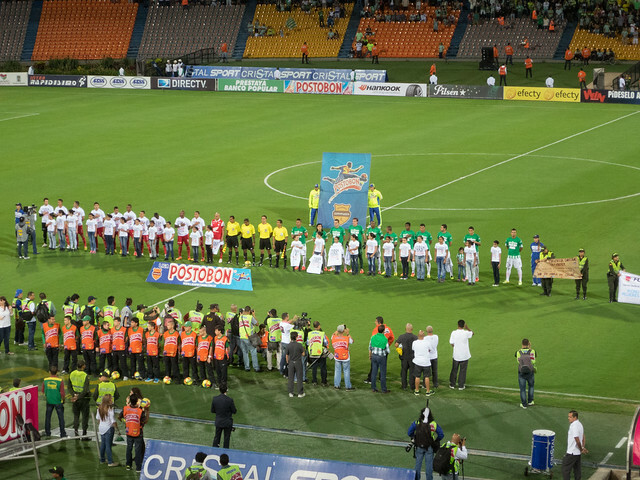 Nacional had lost the first match, played in Bogotá by a goal, which meant they’d have to win by two goals at home in order to advance to the Liga Postobon Championship. It was do-or-die for the green and white. I met Eric at the Estadio metro stop, and we walked over to the same out-of-the-way box office as I used to purchase my tickets to the Envigado FC match in April. Neither of us were interested in the cheapest tickets in the super fan sections at the northern and southern end of the stadium, which left us to choose between the Oriental (east) and Occidental (west) sides. I’d sat on the Oriental side for all three matches I attended in 2009, and was willing to pay a bit more for a different perspective. Thankfully, Eric was up for it too, so we paid 60,000 pesos ($32) each for tickets on the Oriental side. Once we’d made our way through security, we climbed to the upper deck to discover there was no assigned seating. As we pondered where to sit, a Nacional fan stood up and offered us two empty seats next to him. Perfect! We sat down, and I began waving food vendors over as I hadn’t eaten any dinner. Potato chips, a soda, an ice cream. Everything cost 4,000 pesos ($2). There’s no alcohol served at the stadium. 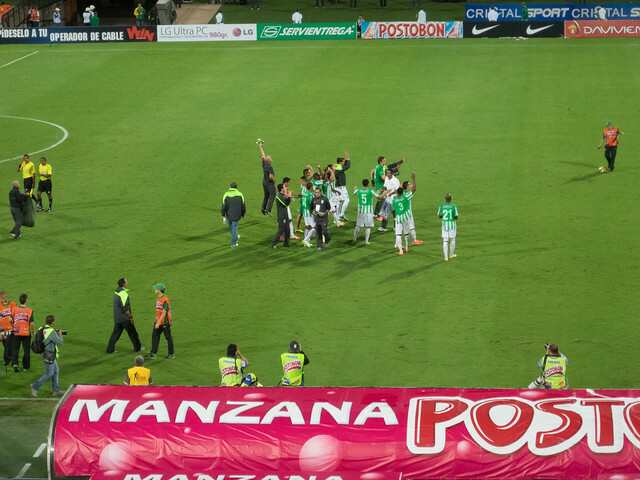 The match was an exciting one, given the whole season was on the line, and Nacional would have to win by at least two goals to advance. Their first goal was scored in the 25th minute by Juan David Valencia Hinestroza, which sent the crowd into a frenzy. I turned to high-five the guy who offered us the seats, and he had the biggest smile on his face. If Nacional held this score until the end of the match, they’d at least force a penalty kick shoot out. But that wouldn’t be necessary, as Nacional’s Jefferson Andrés Duque Montoya scored the second, winning goal in the 61st minute. 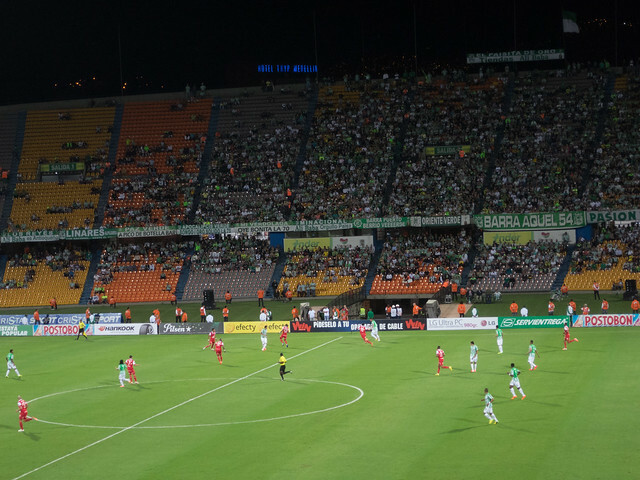 Nacional was able to maintain their 2-0 lead for the remaining 30 minutes, thus advancing to the Championship round against Junior from Barranquilla. 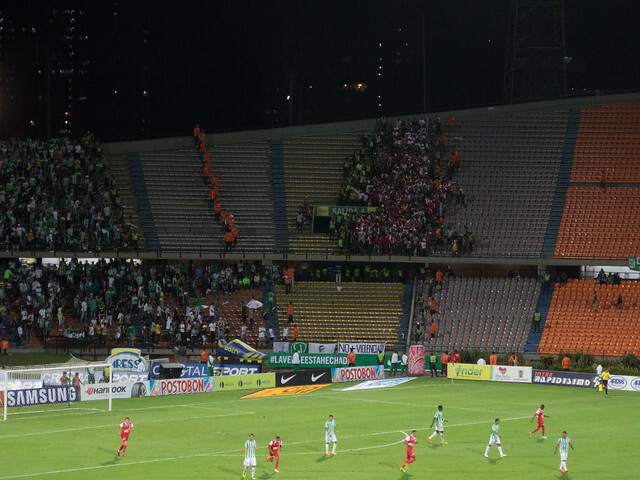 As we now know, Nacional would go on to lose their first match in Barranquilla, only to equalize in the second match at home, forcing a penalty kick shoot out which would see them win the title. For five years, I’ve sat on the sideline, refusing to pick a local team to support. 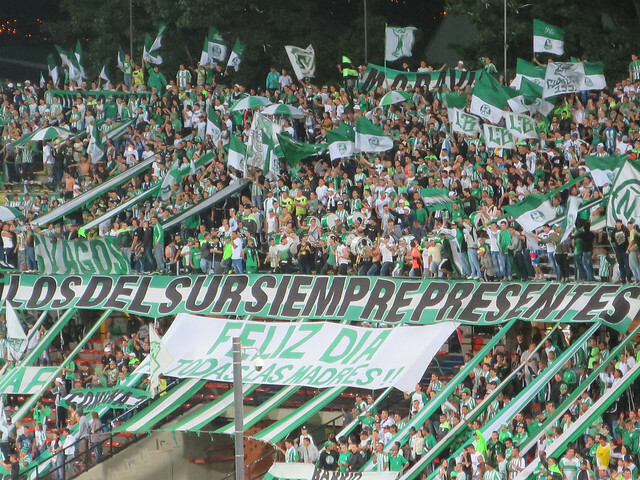 Attending Nacional’s semifinal match helped me realize how much I missed watching live soccer (I use to be a big DC United fan before I left the United States to travel). Atlético Nacional gained a new fan that night.